Ronald Jamison has been painting for as long as he can remember. The Toledo native remembers being influenced at an early age by his uncle, Johanna Nichols, an artist who was one of the founding members of the Conference of Black Artists (COBA) during the 1970’2, a group that also included the estimable Marvin Vines, another Jamison influence. 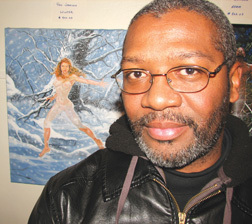 Jamison also likes to delve into comic work, having been influenced by the artists of Marvel, among others. It doesn’t take long for a viewer to realize that Jamison is indeed a student of the comic school of art. His heroic drawings of human characters, frequently amidst the elements, are evocative of the comics. Not an easy calling, he acknowledges. “You have to be dedicated to putting in the time and get good at it,” he says. By good, he also means prolific – that’s one of the keys to success in the comic world – being talented and fast. Jamison is a painter at the moment but he has experimented with sculpture in the past – a medium he would like to get back to in the future. As for the Whitmer High School graduate, he is clearly bullish on his opportunities in the art world. “I think I’m good enough to reach a wide audience,” he says. “There are no boundaries as long as I get exposure … on a national level if I could. It’s limitless.